There are a host of concierge-esque apps out there already, but sometimes you just want the one that's the butler with the black tie. 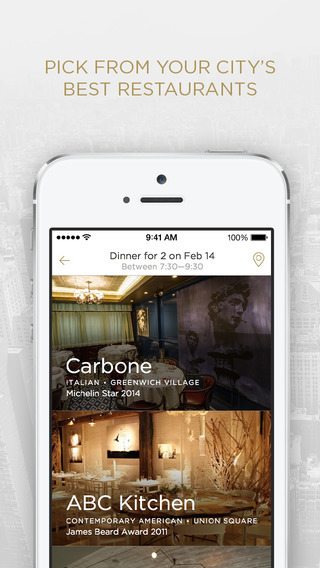 Now, a new app that has launched in New York, Boston, and L.A. is able to score you seats at the hottest eateries...all you have to do is be a little flexible. According to travelandleisure.com, the new Reserve app was created by the inventors of Uber, to revolutionize your dining experience in much the same way they have turned random drivers into your personal chauffeurs. Simply enter the desired reservation time, date, and party size, and Reserve scans for spots that'll satisfy. Results that interest you will be updated in availability by text. Reserve's ability to infiltrate the upper echelon of excellent eateries is aided by their request that your timeframe be somewhat flexible. If you enter the option that you'd like to dine between 8 and 9:30 PM, the restaurants can better plan how to seat and serve all of their patrons, and can anticipate how to react most efficiently when they can assemble the best possible schedule. This allows you to get into top-shelf spots without worrying that you're not cool enough to dine at the "right" time...they've got your info, and they'll let you know. Helpful photos let you decide by decor, if that's more your style. You only want the best seats at the finest restaurant if you're going to indulge in serious culinary craziness, like fugu sushi. That was very interesting to read this interview. I also recommend you to read this article on how to install mSpy.